Having a bad hair day? Yunz best redd up yer head with my new red hat! I took my sack of yarn to Brooke's and while we watched the entire Lord of the Rings extended dvd, I crocheted several hats. 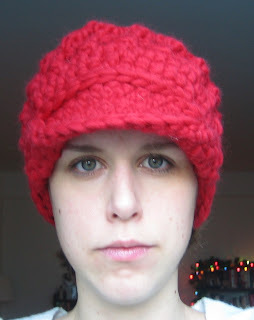 The last hat that I gave up on was the red hat, which ended up being my favorite! 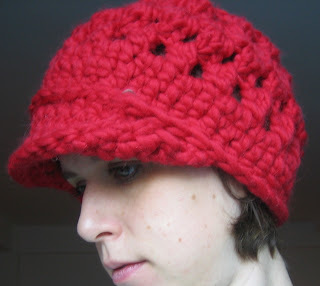 I used an old pattern for a beret, but added a brim. I was frustrated that the brim wasn't looking brimmy enough so I sewed two sides up. I loves it! Then I did a row of sc on the outside of the hat and above the brim, which I think gives it a really polished look. I took a lot of pics from alot of angles bc I loves it!